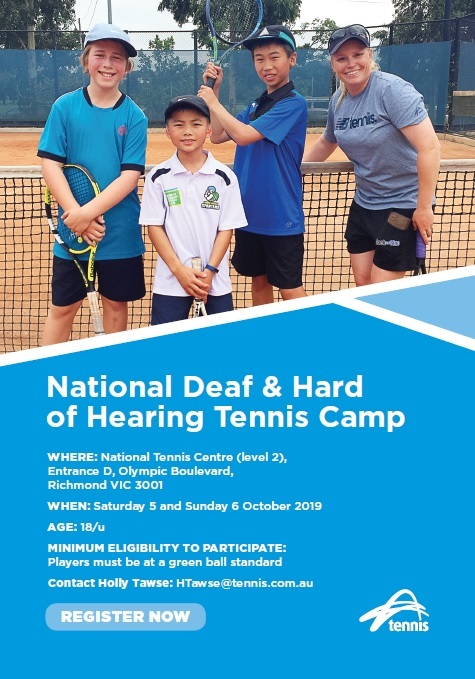 Tennis Australia is excited to announce that it will host a National Deaf and Hard of Hearing Development Camp. This will be an opportunity for players from across the country to learn new skills, access great coaching, and meet new friends. The camp will include both on-court and off-court activities. Minimum eligibility to participate: Players must be at a green ball standard to participate. Travel grant: Interstate players will be provided a $250 travel grant. *Group block has been set aside for interstate players. If you cannot attend the National Deaf and Hard of Hearing Development Camp in October but are interested in trying out for a state or national squad, we would still like to hear from you. And state what level of tennis you currently play at (i.e. Pennant level if possible, etc. ).